Carey Mulligan is reportedly the director’s favourite to play Hilary Clinton in the most-talked-about movie of the moment, Rodham. Jessica Chastain, Reese Witherspoon, Amanda Seyfried and Scarlett Johansson were all being lined up to play the former US Secretary Of State, but according to new reports in Hollywood, it’s Carey that producers would like to take up the lead role. 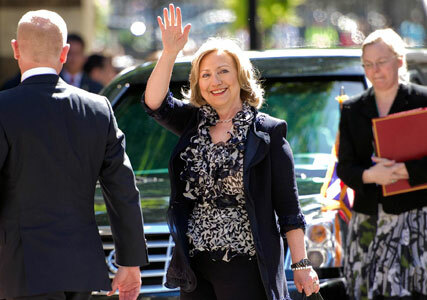 Entitled ‘Rodham’ after the politician’s maiden name, the movie biopic will follow her early years as a lawyer in Washington in 1974 and is set for release in 2016, when Hilary could be a candidate for the Democrats. It’s understood that no official casting decision has been made just yet, but Jessica Chastain has already slammed reports she’s in the running, telling Digital Spy this week that rumours claiming she’s being lined up for the role are “not true”. Could that “wonderful actress” be Carey? Let us know who you think should play Mrs Clinton in the comments box below.